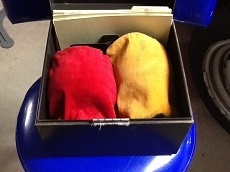 When Dave opened the box, inside were two velvet draw-string bags, each containing a silver chalice. 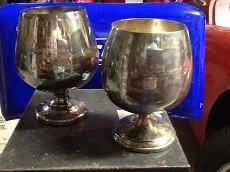 Both chalices were engraved with “David Dooley Chalice.” Moore said he knew nothing about the cups. Recognizing some of the names, I realized most were either deceased or long forgotten. I asked one person whose name was on the “Girl Size” chalice about the cups and she professed no memory about the cups or occasion. 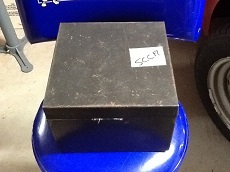 So the chalices, bags and box went into my garage until May,2015. 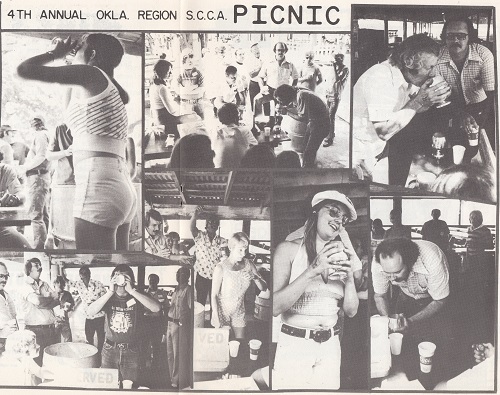 While researching an autocross article for the Gazette, I found a center photo spread in the July, 1975 Gazette labeled “4th Annual Okla. Region S.C.C.A. Picnic”. 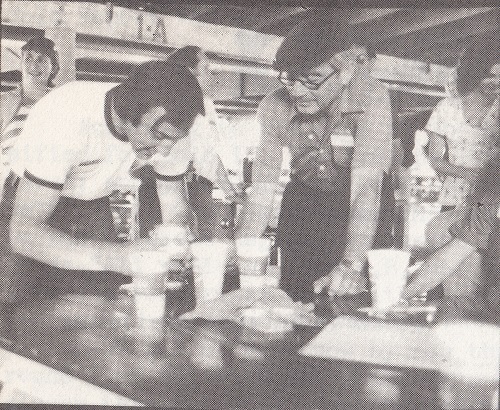 In the photo spread was David Dooley and a number of people drinking from the chalices. I recognized Betty Wills, George Hamilton, Jim Craig, Mike Anderson, Wiley Hunt. Roger Addison and others. Obviously the chalices were awarded to the fastest consumers of beer from the cups.